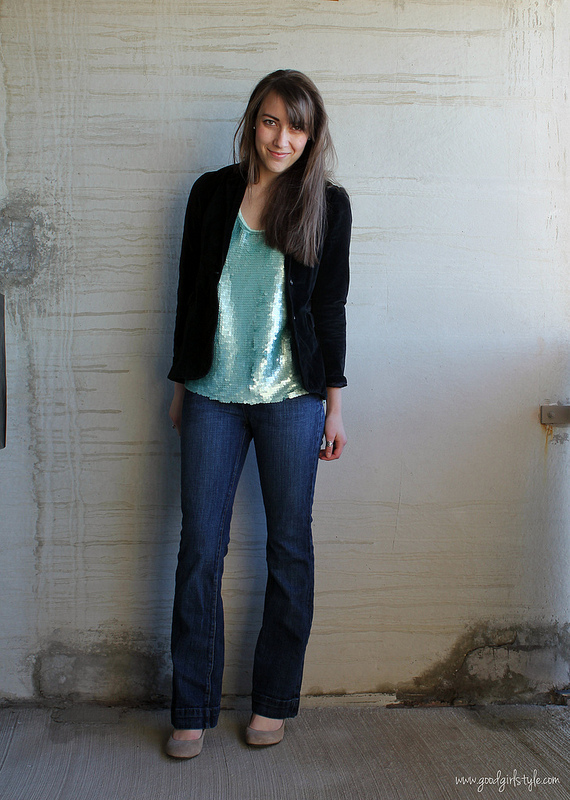 Good Girl Style: Casual Sequins: Oxymoron? My friend told me I don't wear jeans very often. 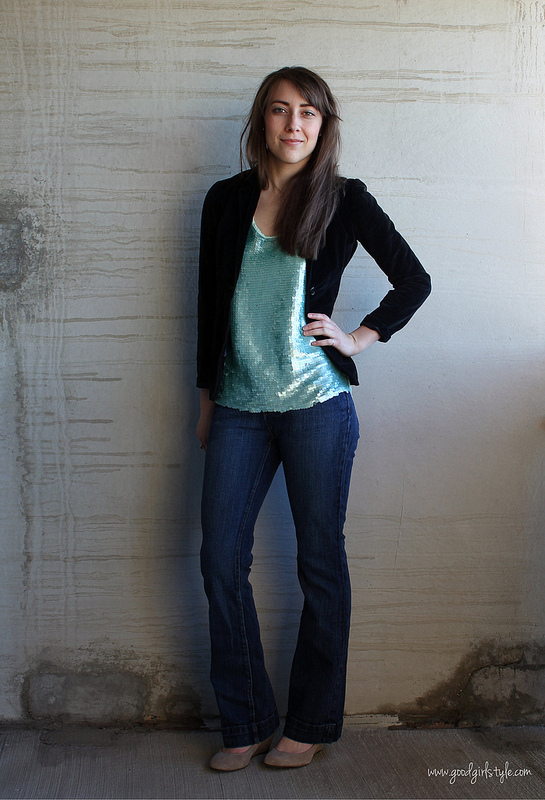 Regular old blue jeans, as opposed to colored denim, because we all know I love my hot pink jeans! I guess it's true...I'm a skirt and dress sorta girl. That, or yoga pants and one of my many sweatshirts. But you don't need to see that. My mom gave me this top for Christmas. My brother (again with my brother nick-naming my outfits/clothing, right? This was my lot in life growing up) calls this the "mermaid top." I think I rather agree this time! The paillettes are a beautiful matte blue-green, but when the light hits them, they shine and come alive. I wanted to try wearing this top in a wearable way. A "Hey, this Mermaid top isn't so scary!" way. So I pulled out the old blue jeans. 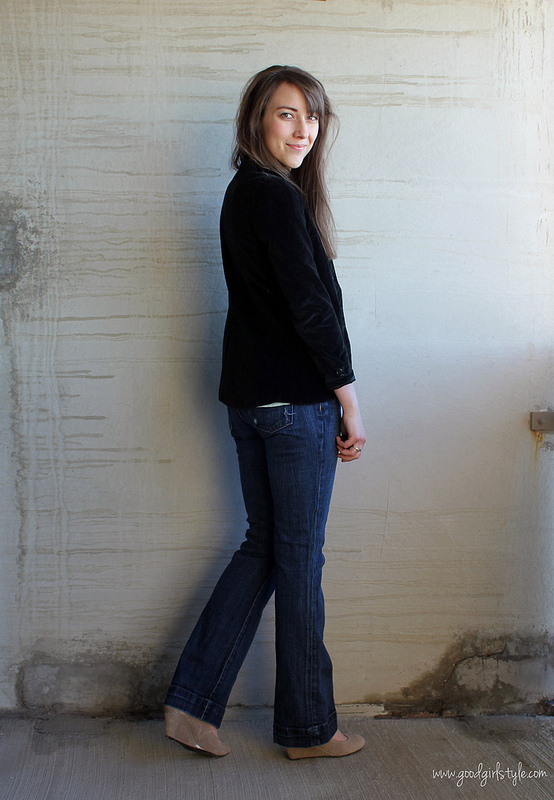 For some texture contrast, I added my velvet riding jacket and my gray suede pumps. Since the top is rather statement-y, I kept my makeup and jewelry very simple. Just a few coats of mascara and this wonderful Pomegranate-Fig Lip Butter I received in a gifted Birchbox, and it was a particularly good hair day thanks to another goodie from my Birchbox. Have you joined Birchbox? It's totally fun...they send you designer beauty samples every month. You can join here! For jewelry, just some simple studs and my favorite rings. If your office lets you wear jeans on Casual Friday, I think this would be the perfect outfit. Take off the jacket, change the heels, add a bit more makeup, and you could head out for a party afterwards! This Missoni bag is my absolute favorite winter purse. It's a consignment store steal, considering it was under $20 and it retails for nearly $500. Tomorrow I'll show you my purse & travel essentials featuring the uber-awesome GoToobs from HumanGear. Also, I've been reading these amazing blog posts about picking the perfect jeans for your figure. Considering they don't make my favorite brand of jeans (what I'm wearing above, Blue Cult) anymore (I don't think...if you know otherwise, please let me know! ), I'll need these tips soon enough. Thanks, Rachel! I can see the difference in your smile from Back to Smiles and here. You definitely look happier and more confident. Girl, this outfit is HAWT. Like, I wanna go get one for myself hawt!